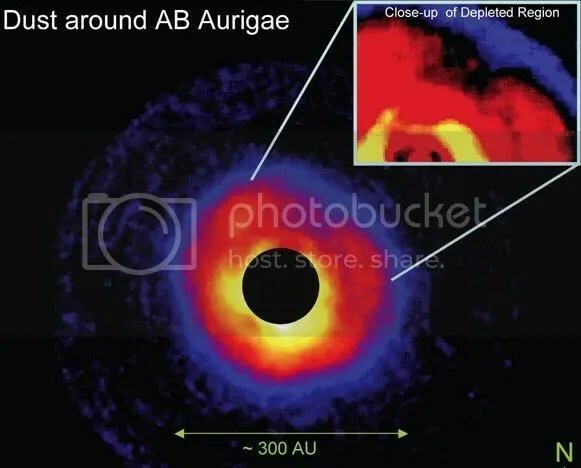 AB Aurigae is a star that should be interesting to any planet formation theorists out there. At a mere 3 million years old, it’s still surrounded by a thick disc of dust, which is thought to be planet forming. Now, courtesy of some nice people at the American Museum of Natural History, comes this image. It’s easy to see a clearing in the star’s accretion disc, and the closeup shows why — that small globule in the centre of the inset image is probably the closest thing to an actual image of an exoplanet that’s ever been taken. The globule itself is not actually the planet, but a cloud of gas and dust that’s growing into a planet. Planets themselves grow from accretion discs not unlike those around stars. Sometimes these are known as “sub-nebulae”. These sub-nebulae then go on to form families of moons, like those around the giant planets in our solar system. Jupiter and it’s horde of satellites, for example, would once have formed from the Jovian Sub-Nebula. The thing is though, that this image is rather different to our own solar system. That sub-nebula is (at a loose guess) about 100 astronomical units away from the central star. That’s a long distance by planetary standards with Earth, by definition, being 1AU from the Sun. It also looks to be around 1AU in diameter. In my humble opinion, this little globule might actually grow up to be a brown dwarf, or even a red dwarf star (known as a “low mass companion star”). I’d put money on it, but I doubt William Hill will still be running in 10 million years time when the system finishes accreting… You never know though. I wonder what the odds are. How exciting! As soon as all the planet finding missions get underway, I can’t wait to see further images of this star system! I bet there are several other planets hidden amongst the dust, slowly growing in size. At only 2.5 solar masses, this star could eventually be quite accomodating to life, too. This entry was posted in astronomy, Imported from Livejournal and tagged astronomical images, planets, stars. Bookmark the permalink.